What do a stripper, a housewife and an orphan all have in common? Butter. More specifically, butter carving. In small-town Iowa, the annual butter carving contest is a chance for vengeful lovers, ambitious politicos and youthful dreamers to prove their worth and, perhaps, make a much needed change. When I heard about the concept behind Butter, I knew it was meant to be. It involves the most unusual combination of dynamic personalities like, ever, competing in a butter carving contest! Does it get more ridiculous than that? Well, yes, but only when you're watching strippers battle werewolves. But Butter isn't all absurdity, oh no, it's much more than that. Butter is a smug satire that will jostle you with its provacative humour, and at the same time, touch you with the endearing message behind it. The synopsis may be unconventional but the ensemble is full of familiar faces and is one worth noting. In Butter, the women take the lead with Jennifer Garner, Olivia Wilde and newcomer, Yara Shahidi, all delivering strong performances. I have to say, Shahidi and Wilde blew me away with clever, tongue-in-cheek characterizations of both an orphan and stripper respectively. Seriously, I was completely caught off guard, especially by Wilde. They are, by far, the best and most unexpected performances in the entire film. And the hilarious scenes with Shahidi and her adoptive father (played by Rob Cordrry) are second to none! But while I do find the movie entertaining, it does sometimes verge on inauthentic, the humour occasionally lacking in subtlety and finesse. Another problem is that the movie is pieced together like a series of comedy sketches rather than having the organic flow that it should. This isn't director, Jim Field Smith's, first rodeo by way of comedy either. I was actually quite fond of his 2010 debut of She's Out Of My League. Being Field Smith's sophmore work, Butter isn't always spot on but when he gets it, he really gets it. The humour is mostly politically centric and takes on a superior sort of attitude which will score with some and offend others. But hey! That's what a satire is supposed to do, right? 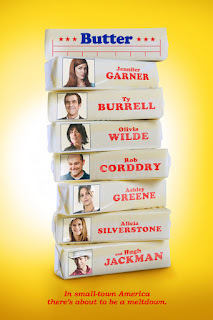 At the core, Butter is a little indie film with frequent laughs and lots of heart. 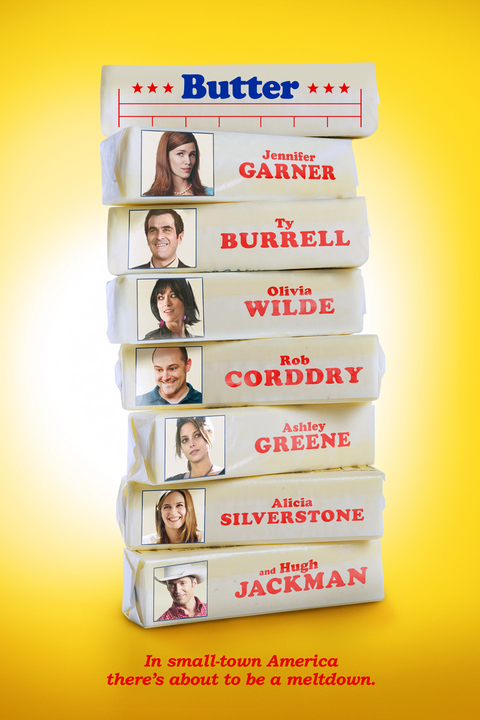 On the surface, Butter may not seem like anything other than a series of ridiculous hijinks, but if you take the time to dig below the surface, you'll find a touching farce that speaks volumes about American culture, politics and ambition. And yes, though it sometimes misses the mark, it'll still manage to melt your heart... just like warm butter. This looks funny! I like Jennifer Gardner. Is that Hugh Jackman? Ha, yes, it is Hugh Jackman. He has quite the entertaining cameo in this movie. I just watched this yesterday after reading your review on it. It was really funny. I'm so glad I decided to watch it. The stripper made me laugh so hard. YAY! I'm so pleased you enjoyed it! Olivia Wilde was certainly impressive and one of the funnier folks in this movie.